Much of Covensky's early work contains images from her childhood - flowers, trains, games, and scenes of war and destruction. After a year of painting on her own, she decided to attend classes in studio art at Wayne State, where she studied principally with Robert Wilbert, and also with Tom Parish and John Egner. (#2) size 4' 2" x 3' 3"
These teachers did not try to impose their styles on her, but challenged her to understand her own work by verbalizing it to others. It was in these classes that Covensky was exposed to the work and ideas of Kandinsky and the Abstract Expressionists through the writings of critics such as Harold Rosenberg. (#3) size 1' 4" x 1' 8"
The emphasis of Abstract Expressionist theory on the act of painting itself, rather than on any stylistic aspects of the finished work, freed Covensky from her concern with how her work related to that of other artists and enabled her to give form to the personal feelings that had orginally prompted her to turn to painting. "I felt that everything I put on the canvas came from within me-- I didn't have to look at anything else to do it. It just came from my head, and in that sense it was pure and honest; it was me." (#4) size 2' x 2' 8"
Covensky has not assumed the particular style of any one of the Abstract Expressionists. Instead, she has embraced their general approach and philosophical attitude toward art and the handling of materials, and has accepted their aim of pictorializing tragic and timeless forces. The strength of Covensky's own character finds expression through emphasis on action and gesture, and her energy has resulted in the prolific creation of paintings. 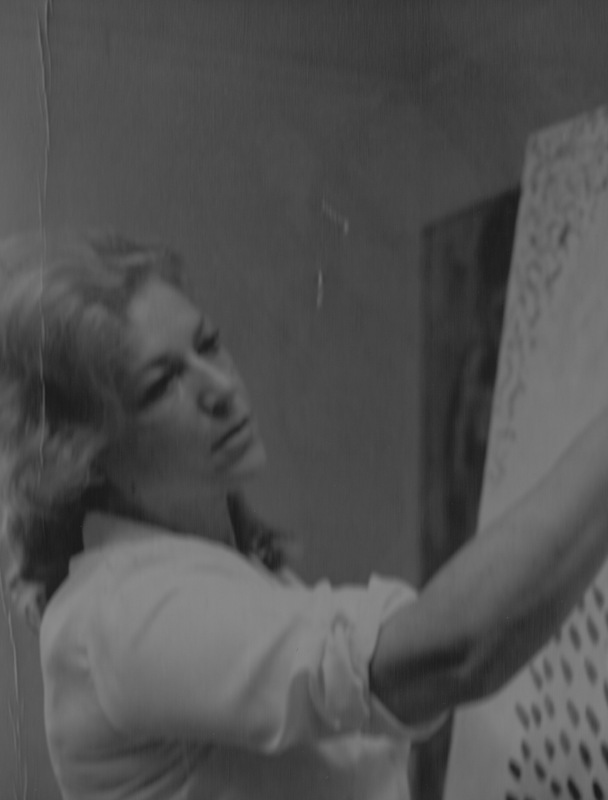 In order to give herself the freedom necessary to find her own approach, Covensky made a decision in the mid-70's not to show her work to curators or gallery owners. During this time, her mature style was established, and it is this body of work that is represented in this exhibition. (#6) size 3' 7" x 3' 7"
Covensky has always worked in series, with the one begun in 1975 serving as the source for the paintings exhibited here. The canvases in this series are characterized by large scale, exceptional painterliness, and a complexity of surface that conveys the "vital energy" and "perpetual motion" Covensky considers important in her work. These are intense paintings, in which the compositional and physical denseness is extraordinary. (#7) size 6' 9" x 4' 11"
Covensky adds layer on layer of paint, sometimes working on a canvas intermittently for several years before she feels it is completed. In most of these paintings the strong motion of the brush is evident, the diagonal marks of paint convey great energy. In other works the brush strokes are calligraphic and lighter in feeling. 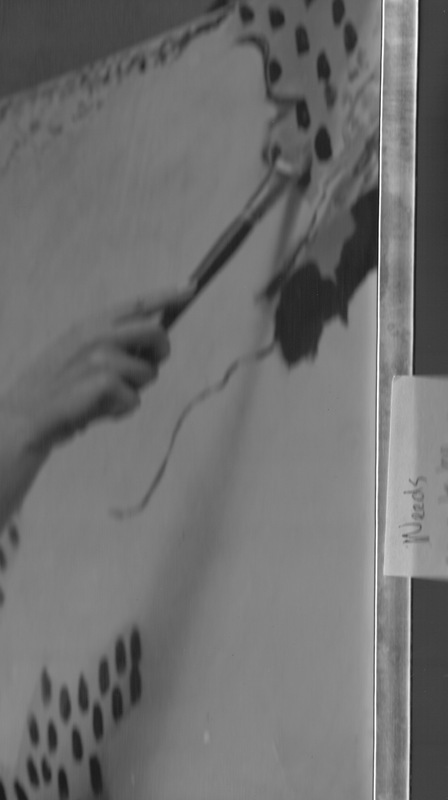 The paint surface is almost always so thick that the painting itself becomes a three-dimensional object, resulting in a unique richness of texture and surface. The suggestions of movement produced by the thick layers of pigment are increased by the complexity of Covensky's colors. A number of hues is employed in any one canvas, and the artist frequently combines such complementary colors as red and green, or purple and yellow, to set up illusions of space. The variety of color from canvas to canvas, as well as the changes in density of paint, led to the expression of different emotions. Some of the paintings are light to value and touch, others are dark, brooding, and violently energetic. Covensky occasionally gives titles to her works after they are completed, associating the work with the names of members of her family or of close friends. For example, the strident lines of yellow, orange, and blue in one painting evoked for Covensky the memory of the tragic death of a friend. Since Covensky established her formal language in 1975, four additional series of works have emerged, sometimes concurrently. Each series seems to focus on different qualities that appeared in the first group of works. In the second group of paintings from 1975-79, Covensky still emphasized diagonal elements, but the paintings are much less dense and there are often fairly extensive areas of one color or closely related colors. The artist frequently uses solid backgrounds in these works, rather than integrating all the areas of paint as in the first series, and the backgrounds and other sections are brushed. In this series, Covensky explored the compositional possibilities of the diptych and triptych, formats that offer a large field for the interplay of movement and intense color. (#12) size 1' 7" x 1' 7"
The two canvases exhibited here from the third series are painted as densely as those in the first, but they are principally composed of roughly square strokes of paint, which cover the entire surface of the canvas. These paintings are like metaphors for organic growth, the overall values are lighter here than in the previous two series, and the dominant hues are greens and magentas. Since 1979, Covensky's work has become more open in composition, and a great deal lighter in color. In the earlier paintings from this period, Covensky explored the use of brushed areas of pigment on a white ground; in the most recent group she has created the diagonal lines exclusively by throwing, rather than brushing, the areas of paint. The variety of color characteristic of the earlier work remains in these, but the thick pigment is limited to one area. How can one be an abstract expressionist painter in the 1980's? This first great American avant-garde movement has long since been followed by other styles. Covensky is an "action painter", working in the expressionist tradition that emerged in late 19th-century Europe in the work of Vincent van Gogh, James Ensor, and Edvard Munch. This mode was further developed in the 20th century by Wassily Kandinsky and the German Expressionists, who in turn influenced the American Abstract Expressionists such as Jackson Pollock and Willem de Kooning at mid-century. After the stylistic restrictiveness of the 1960's, artists of the '70s investigated many options; this pluralism has led to a re-exploration of a number of earlier 20th-century forms. Covensky's work evolved in this climate, which welcomed a variety of means of expression. Covensky's paintings show that an earlier style can be a valid mode if it is truly appropriate to an individual's needs, and not explored solely for formal reasons. The validation of an expressionist style is largely in the force of the personal feelings conveyed. Her paintings embody the vitality of her own character; they also bear witness to the lives of her family members that were lost. The continuity of her life and feeling is thus expressed in work rich in energy, strength, and affirmation.